Fun, exciting classes that teach your child self-defense, help them get in great shape, and most importantly… provide the tools they need for a happy, successful life. From focusing, to goal setting, to self-discipline, to self-respect – your children emerge from this program changed for the better. And their parents couldn’t be happier. Clear Focus – In martial arts, we have children do one thing at a time. For younger ones, and those with severe ADD, they may only do one thing for 30 seconds – but for that 30 seconds that’s all they focus on. Then, the better and better they get at focusing, the longer we have them focus for. Eventually, your child might focus the entire session on just one exercise or activity. Determined to Succeed – From Day 1 in martial arts your child sets goals, and accomplishes them. The more this happens the more ambitious your child becomes. Eventually your child learns to set higher goals – and to go after them with everything he or she has got. Children learn that fulfillment and respect are earned through completing challenges. Because of this, children who go through martial arts are much more likely to succeed later in life as well. A recent study showed that 63% of black belts become college graduates! That’s because in martial arts – we teach your child to look people in the eyes when they’re being spoken to. We teach them that this is how you show people you’re listening, and paying attention. After just a few short weeks, your child naturally begins doing this at home. And in school. Completing Tasks the First Time Asked – In martial arts, we have just a few simple rules. One of those rules is that when your child is asked to do something – it is done the first time. We never yell at children, or scold them, if they don’t do something. Every child does it because the others in the class do it. It’s usually a matter of a couple weeks before your child starts doing this at home, too. I can’t tell you how many parents have thanked me profusely when it starts to happen. Self-Respect – When it comes to bullies, children in martial arts don’t back down. They have the confidence to look a bully in the eyes, and stand their ground. It happens 9 times out of 10. And for the 1 time out of 10 the bully doesn’t back down – your child has the tools to defend, get away, or seek out an authority figure. Weight loss – It’s easy these days for children to not exercise. As a result, many children experience weight problems at a young age. Martial Arts is an amazing form of exercise – Your child will be active the entire time. But there’s no pressure to do anything too difficult. We encourage your child to do his or her best. Most importantly, your child will have a ton of fun. And if your child is overweight – martial arts will help. This reduces risk for many health problems that can occur now, and later on in life. 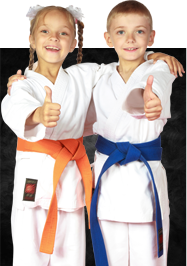 Kids Karate also increases energy, alertness, and overall happiness. Your child will never feel better.